1. Love, and you shall be loved. All love is mathematically just, as much as the two sides of an algebraic equation. 2. He who is in love is wise and is becoming wiser, sees newly every time he looks at the object beloved, drawing from it with his eyes and his mind those virtues which it possesses. 3. DEAR FRIEND: If I was sure of thee, sure of thy capacity, sure to match my mood with thine, I should never think again of trifles in relation to thy comings and goings. I am not very wise: my moods are quite attainable: and I respect thy genius: it is to me as yet unfathomed; yet dare I not presume in thee a perfect intelligence of me, and so thou art to me a delicious torment. Thine ever, or never. 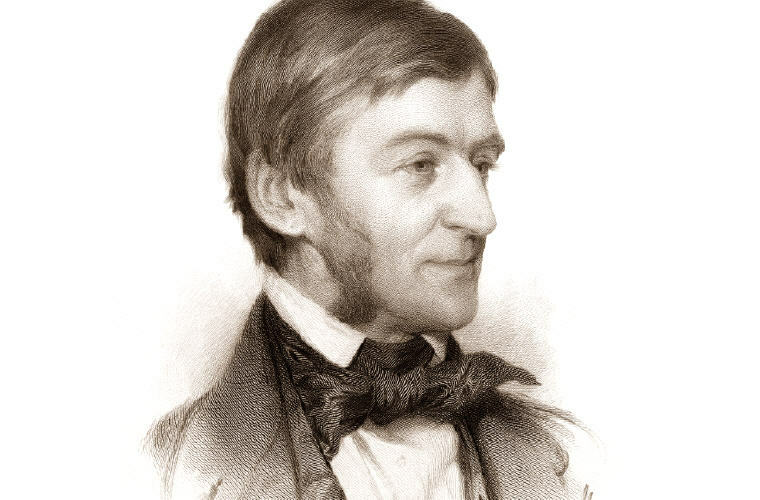 Excerpt from Wikipedia: Ralph Waldo Emerson (May 25, 1803 – April 27, 1882) was an American essayist, philosopher, and poet, best remembered for leading the Transcendentalist movement of the mid 19th century. His teachings directly influenced the growing New Thought movement of the mid 1800s. He was seen as a champion of individualism and a prescient critic of the countervailing pressures of society. 1. Do not be too timid and squeamish about your actions. All life is an experiment. The more experiments you make the better. 2. Every revolution was first a thought in one man’s mind and when the same thought occurs in another man, it is the key to that era. 3. Thought is all light, and publishes itself to the universe. It will speak, though you were dumb, by its own miraculous organ. It will flow out of your actions, your manners, and your face. It will bring you friendships. It will impledge you to truth by the love and expectation of generous minds. By virtue of the laws of that Nature, which is one and perfect, it shall yield every sincere good that is in the soul, to the scholar beloved of earth and heaven. 4. A great man is always willing to be little. 5. Nothing can bring you peace but yourself. Nothing can bring you peace but the triumph of principles. 6. To believe your own thought, to believe that what is true for you in your private heart is true for all men, — that is genius. 7. Trust thyself: every heart vibrates to that iron string. Accept the place the divine providence has found for you, the society of your contemporaries, the connection of events. Great men have always done so, and confided themselves childlike to the genius of their age, betraying their perception that the absolutely trustworthy was seated at their heart, working through their hands, predominating in all their being. 8. It is easy to live for others; everybody does. I call on you to live for yourselves. 10. Respect the child, respect him to the end, but also respect yourself. Be the companion of his thought, the friend of his friendship, the lover of his virtue, — but no kinsman of his sin. 11. Character is higher than intellect. Thinking is the function. Living is the functionary. The stream retreats to its source. A great soul will be strong to live, as well as strong to think. 12. Let me never fall into the vulgar mistake of dreaming that I am persecuted whenever I am contradicted. 13. Nothing great was ever achieved without enthusiasm. 14. Before we acquire great power we must acquire wisdom to use it well. 15. Every man I meet is in some way my superior; and in that I can learn of him. 16. Thought is all light, and publishes itself to the universe. It will speak, though you were dumb, by its own miraculous organ. It will flow out of your actions, your manners, and your face. It will bring you friendships. It will impledge you to truth by the love and expectation of generous minds. By virtue of the laws of that Nature, which is one and perfect, it shall yield every sincere good that is in the soul, to the scholar beloved of earth and heaven. 17. The reason why the world lacks unity, and lies broken and in heaps, is, because man is disunited with himself. 18. It is not length of life, but depth of life. 19. Respect the child. Be not too much his parent. Trespass not on his solitude. 20. To different minds, the same world is a hell, and a heaven. 21. People seem not to see that their opinion of the world is also a confession of character. 22. The ancestor of every action is a thought. 23. The man who renounces himself, comes to himself. 25. The only gift is a portion of thyself. 26. The only money of God is God. He pays never with any thing less, or any thing else. The only reward of virtue is virtue: the only way to have a friend is to be one. 27. A friend is a person with whom I may be sincere. Before him I may think aloud. 28. This time, like all times, is a very good one, if we but know what to do with it. 29. Do what we can, summer will have its flies: if we walk in the woods, we must feed mosquitos: if we go a-fishing, we must expect a wet coat. 30. Our strength grows out of our weakness. The indignation which arms itself with secret forces does not awaken until we are pricked and stung and sorely assailed. 31. These times of ours are serious and full of calamity, but all times are essentially alike. As soon as there is life there is danger. 32. You can never do a kindness too soon, for you never know how soon it will be too late. 33. Don’t waste life in doubts and fears; spend yourself on the work before you, well assured that the right performance of this hour’s duties will be the best preparation for the hours or ages that follow it. 34. For this new morning with its light, Father, we thank Thee. For rest and shelter of the night, Father, we thank Thee. For health and food, for love and friends, for everything Thy goodness sends, Father in heaven, we thank Thee. 35. Though we travel the world over to find the beautiful, we must carry it with us, or we find it not. 36. What is a weed? A plant whose virtues have yet to be discovered. 37. To finish the moment, to find the journey’s end in every step of the road, to live the greatest number of good hours, is wisdom. 38. Dream delivers us to dream, and there is no end to illusion. Life is a train of moods like a string of beads, and as we pass through them they prove to be many-colored lenses which paint the world their own hue, and each shows only what lies in its focus. 39. With the past as past I have nothing to do, nor with the future as future. I live now, and will verify all past history in my own moments. 40. Yet a man may love a paradox, without losing either his wit or his honesty. 41. We are always getting ready to live, but never living. 42. Man exists for his own sake and not to add a laborer to the state. 43. To speak truly, few adult persons can see nature. Most persons do not see the sun. At least they have a very superficial seeing. The sun illuminates only the eye of the man, but shines into the eye and the heart of the child. 44. Explore, and explore, and explore. Be neither chided nor flattered out of your position of perpetual inquiry. Neither dogmatise yourself, nor accept another’s dogmatism. 45. But the real and lasting victories are those of peace and not of war. 46. Beauty without grace is the hook without the bait. 47. One of the illusions is that the present hour is not the critical, decisive hour. Write it on your heart that every day is the best day in the year. No man has learned anything rightly, until he knows that every day is Doomsday. 48. Don’t waste yourself in rejection, nor bark against the bad, but chant the beauty of the good. 49. The true test of civilization is, not the census, nor the size of the cities, nor the crops – no, but the kind of man the country turns out. 50. Life is not so short but that there is always time enough for courtesy. 51. My garden is an honest place. Every tree and every vine are incapable of concealment, and tell after two or three months exactly what sort of treatment they have had. The sower may mistake and sow his peas crookedly: the peas make no mistake, but come up and show his line.